The trains in Thailand are pretty good despite a few derailments in 2013. They are comfortable, safe (normally) and well maintained. What's more they are cheap. Train ticket prices increase in very small increments. This is the advantage of a state run train system: it is designed to be affordable to all and not to over-charge foreigners. Every year the timetable changes slightly. The above was updated May 2014. As you can see from the list of prices above, you can get a 2nd class sleeper for 848 THB. If you choose a top bunk it is 50 to 100 Thai Baht cheaper. A few trains have non air-con 2nd class sleepers that are 160 to 200 Thai Baht cheaper. A child is classified as between 100 and 150 cm in height. The sleeper carriages are well organised. In second class you have a soft seat and table which the carriage attendant will transform into a bed for you early in the evening. Vendors go up and down the aisles selling food and cold drinks. There is also a buffet car where you can buy food and drink and even smoke. It is permissible (though not strictly allowed) to smoke in the toilet areas between carriages. In first class you get a 2 person compartment with basin, power point and door you can shut from the inside. Lower bunks are 200 Thai Baht more expensive than upper bunks. Bring a sweater or blanket as the air-con can make the compartment very cold. You can pay a supplement of 500 Thai Baht if you are travelling alone to get a 1st class sleeper all to yourself. One advantage of first class is that you get access to a toilet that is never crowded. The train leaves from Hualamphong Station in Bangkok. 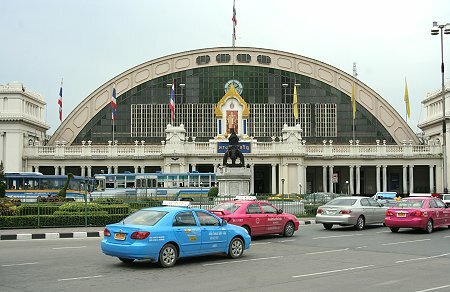 This is the main train station in Bangkok that is located in Chinatown. It is easy to reach via the metro or the skytrain. The counter to make advanced bookings is to the right of the departures and arrivals board. It's a straightforward procedure even without any Thai speaking skills. You used to be able to book tickets online but Thai Railways have discontinued this service. There website tends to be in various states of repair with pages sometimes missing. Chumphon station is near the centre of town and is a good connection for those taking Lomprayah or Seatran ferries. The fares to Chumphon from either Suratthani or Bangkok are about half the full fares quoted above. Suratthani train station is a misnomer. It takes an hour to drive there from Suratthani port. Strictly speaking it's Punpin Station. Check to see if your boat / train ticket includes a transfer from the pier to the train station when you buy it. This is the main disadvantage of taking the train to Bangkok. Even if you catch a late boat to Donsak or Suratthani you still have quite a long drive to the train station and more then likely a few hours to wait until your train arrives. 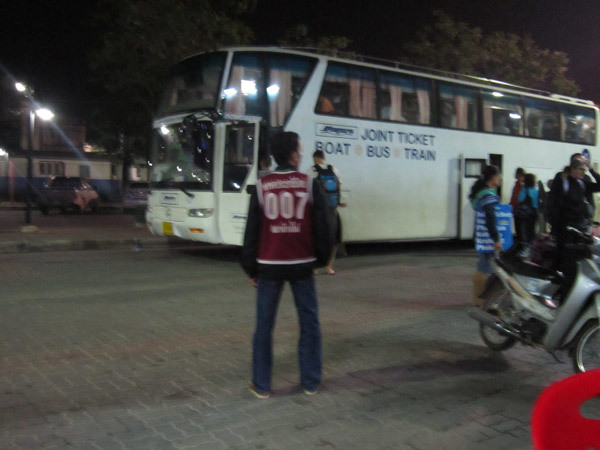 When you arrive in Punpin Station (probably early in the morning) there are buses just outside the station to take you to a ferry pier. You can buy tickets from the ticket sellers outside the cafe. If you can't afford an airplane ticket but want more comfort than a seat on a bus then the train is your best option. You can now book train tickets online. See the link on the right. However, as prices of fly and ferry tickets decrease the train seems less appealing to those who want a faster journey without paying the high prices that Thai Airways charge. Finally, it is worth noting that the southern train line goes all the way to Kuala Lumpur and Singapore. It is a long train line and a useful way to get up and down the narrow corridor of land below Bangkok.